As in years past, Week Zero opened with ‘Bowl Games’ in Kentucky. The past two years opened in Nicholasville, Kentucky at the VisitNich.com Bowl featuring both West and East Jessamine. Neither one of these two bowl games interested me, and I hadn’t really planned on attending another. Not that the staff didn’t put on as best an exhibition as they could, but just that their two stadiums were beyond bad. West Jessamine hosted in 2012, and their stadium’s home side faces due west. Not a great thing for games starting around 5pm in late August. East Jessamine hosted in 2013, and their stadium has a tremendous amount of open sideline space between the field and the stands. Throw in four games that have been mostly forgettable, and I wasn’t interested in seeing if the third time’s the charm. However, this year had two added bonues. With Tennessee also starting the same weekend, it opened up two more games. There were several East Tennessee games on Thursday, and also a marquee game on ESPN for Sunday afternoon. Based on scheduling, I planned to attend the McCallie-Cleveland game at Chattanooga on Thursday to open the season. Now, if you’ve read my posts before on HS Football, part of my interest is in travel, just as much as it is football. So, on Wednesday and Thursday, I traveled down to Chattanooga and took in some sights through southwest Virginia, western North Carolina, and far southeast Tennessee. I visited a few more counties I had yet to be in, and saw some sites around the Smoky Mountains. On my trip down, I realized I forgot my new camera back home, and had to buy a rather cheaper digital camera for the weekend. When I do post photos of these games, you’ll probably note the difference. On Thursday night, I was at UT-Chattanooga’s Finley Stadium. Parking was expensive, and the tickets were fairly expensive. This game was billed as a rematch of a great game last year. McCallie, a private all-male secular school, ran roughshod over Cleveland (TN), 44-0. The stadium had very few people, and it was a one-sided matchup. It was an interesting way to open the season. But, I then had my Kentucky games to attend on Friday night. This year, I opted for the Ray Correll Bowl in Somerset, Kentucky. I had been through Somerset several times in the past. It’s a nice town, though, it is a lot bigger than you think. The two games that night consisted of the three local teams (Pulaski County, Southwestern, and Somerset) along with regional participant Corbin. Corbin is noteworthy as the hometown of Colonel Sanders of KFC fame. Though, in light of that, Lee’s Chicken in Kentucky is much better than KFC and a place I always make a point of stopping at when in the Bluegrass State. Now, after one mercy rule game, I was treated with two more and a heat-delay. The start time was moved back on hour due to the heat, and neither game was all that entertaining. Again, an oddity, the home stands faced west and I opted for a spot on the ‘away’ side to stay out of the sun. Kentucky HS Football is fairly decent, but it’s definitely not Ohio or even Pennsylvania. Though, along with the southern style, it’s much more on speed and deception than brute force and proper tackling. It can be a very sloppy game with bad fundamentals. In the first game, Pulaski County crushed Corbin 39-13, and Southwestern demoralized Somerset 38-7. After spending the night in Somerset, it was a short drive west across the Cumberland Parkway to Bowling Green for my second year at the Rafferty’s Bowl. The same four teams participated this year, with Bowling Green’s long win streak coming up against Mercer County of Harrodsburg, KY. Last year’s Bowling Green-Lexington Catholic game was a good one. This year, with the pairings alternated, and Bowling Green playing at Lexington Catholic in Week 1’s Bluegrass Bowl, I was treated to two mismatches. The games are held at LT Smith Stadium, home of the Western Kentucky Hilltoppers. It’s a great venue, and suited very well for high school football. Also, a key reason the state championships have moved out to Bowling Green as well. With its double-deck construction, it also creates a much needed guard from the sun and or weather, which came into effect. Sitting under the overhang, as bad weather rolled in during the games, I and most everyone else was protected from the heavy rain. The first game of the day was Lexington Catholic absolutely destroying Allen County-Scottsville, 43-15. This scoreline doesn’t even do it justice. It was 43-0 in the second quarter. ACS just wasn’t a good team, and was matched up with a goliath. Now, as the bad weather was setting in, it became apparent that the Sunday game in Tennessee may see a heat-delay. I was debating on whether to leave straight from Kentucky back to Ohio or to stick around Tennessee Sunday to see if the game would be played. The storm was hitting hard east of town, and had delayed the Barren County Bowl taking place in Glasgow, KY. A lightning delay there was seriously messing with games. Also, the Campbellsville “Forcht Bank Bowl” was also being delayed due to lightning. It was becoming apparent that some Kentucky games would be played on Sunday. My hope was for an afternoon game and then still with time to drive to Ohio. As Bowling Green continued the string of five-straight mercy-rule games I had seen to start the season, 44-6, it was announced via Twitter that the Forcht Bank Bowl had cancelled the first game and the second game would take place Sunday night at 6pm. Also, the Barren County Bowl had been delayed from the first game’s late second quarter for quite some time. It was then announced the conclusion of Glasgow-Hart County would start at 4pm and Barren County-Metcalfe County would start shortly thereafter. So, my decision was made for me. Forgoing the Tennessee ESPN game, I spent the night in Bowling Green and drove the half hour east to Glasgow. Looked around the town, had dinner at a rather poor excuse for a steakhouse, and made my way to Trojan Field to see the Barren County Bowl. This stadium had similar phenomena. It faced northwest, and was only on the one side of the field. It was quite a large stadium, and like some other schools in Kentucky, had an interesting setup. In Kentucky, there are city schools and county schools. The county school tends to be rather close to whathever the county seat may be. Barren County’s seat is Glasgow, and the location of the high school. The city’s school, Glasgow HS, is actually further from town than the county school. Which, I find out. However, Somerset and Pulaski County had a similar situation with both schools being close to eachother. Now, because of the weather delay, there was no admission charged for these two games, though they certainly made up for it in water and pop sales. It was hot. And a one-hour heat-delay pushed the start back further. Which made me question the original decision to start the games when they did. However, I got to see two more games. The first game started up in the 2nd quarter for the extra point of Glasgow’s second touchdown. Unfortunately, that would be all they really needed, as Glasgow won 27-0 and gave me my second shutout of the early season. Barren County’s matchup with Metcalfe County would’ve qualified for an OHSAA mercy-rule, but came close to a Kentucky mercy-rule, 36-3. This was the first game where the winning team trailed at some point. Which, is astounding when you figure this was the seventh game I’ve attended this year. After that, it was a long drive home, that didn’t get there until Monday afternoon. After my trip around Tennessee, Kentucky, North Carolina, and Virginia I was up for a much more subdued affair in Week 1 to kickoff the Ohio season. And as usual, this meant a trip to the Cincinnati area for the Skyline Chili Crosstown Showdown. Unlike in years past, there were very few game opportunities. The past two years had games on Wednesday, and/or Sunday. Also doubleheaders on Thursday and multiple games on Saturday. This year, there were no Wednesday games. And only single Thursday games. So, instead I opted for Girard hosting Campbell Memorial to kickoff the Ohio season. I had wanted to see a game at Girard for a while, and felt this was my best chance. Now, in case you may be wondering and haven’t figured out, I moved from Steubenville, Ohio recently and though I have no misgivings about the city, it was my home, but isn’t any longer. So, I’m not going out of my way to watch Big Red games. Though, I certainly hope they do well and will be cheering for them otherwise. However, being that I’m in rural Trumbull County now, I’ve opted for a Thursday night game closer to home. And, a venue I’ve wanted to see since they’ve renovated. Struthers does have a nice stadium. And the crowd was great for this game. In fact, the stadium may be a little too small for a big game as I wound up sitting on the visitors side. And again, my bad luck continued as another mercy-rule game came to fruition. This time, Struthers won 34-8. By this point, my choice of games, when it comes to competitiveness, has been subpar. But, I still enjoyed them. So, Friday morning it was a drive to Oxford, Ohio to Miami University’s Yager Stadium. First time at this venue. And though it’s far from the city of Cincinnati, it’s a great venue for high school football. The doubleheader consisted of Lakota West taking on defending Division II champion Loveland, and the nightcap, Colerain vs. La Salle. The first game, was finally a good game to start the season. Loveland drove down the field late, but ran out of time in the redzone, losing 49-46. The nightcap was a bit of a let down, as Colerain just isn’t the team they usually are. La Salle won easily 40-21. After spending the night in suburban Cincinnati, it was on to the Sheakley Athletic Center for a triple header on Saturday. Because of the renovations to Nippert Stadium, the only major ‘event’ taking place this weekend for the Crosstown Showdown was at Sheakley. It’s a practice facility for the football team, and used for lacrosse for the university. It’s a decent venue, with great sitelines. But, it just doesn’t feel like an appropriate venue. I did get to cross paths with NewarkCatholicFan again. Last year, we saw the games in Pikeville and Belfry, Kentucky together in Week 1. I had company myself, so it was just a brief meeting. Plus, he had a press pass and was safe from the rain that came during the games. The first game was a matchup between Finneytown and Bellevue (KY). This was my first time seeing either team, and maybe my last. This game was sloppy. I lost track of the fumbles, and NCF says there was 7 interceptions. In the end, Bellevue beat Finneytown, 27-20. The second game, in the rain, was Northwest playing Anderson. Anderson has fallen off in recent years, and isn’t a match for the Skyline games I’ve seen of them. Northwest did what Colerain could not, and won 19-17 in a good game. The finale was the game of the weekend. Mt. Healthy jumped out to a 28-0 lead before Beechwood (KY) made a valiant effort trying to comeback. A late interception doomed them, and Mt. Healthy hung on for the 40-34 victory. After the game, it was another night in suburban Cincinnati. In the morning, it was another long drive to Lakewood, Ohio for a 4pm game at Lakewood’s First Financial Lakewood Stadium. This game was for ESPN, and I opted to sit on the Gilman side out of the sun. Though he Gilman side was small, the fans that were there were quite knowledgable and definitely knew about St. Edward. St. Edward, though, just obliterated Gilman and forced the mercy rule. One chuckle I got from this was St. Edward students chanting “This is our house” in a stadium that wasn’t theirs. Usually this chant is more derisive if chanted by the visiting team, or more traditionally by the home team in their facility. The fact that neither held true made it amusing to me. Parking at Lakewood was decent, albeit entirely street parking. Luckily, an hour before game time I found a spot just a block down from the school. After that, it was a quick drive home and onto more fun. I had originally planned for a game Thursday, three games in Orchard Park (NY), and then eight games in Syracuse (NY). However, the Ralph Wilson Stadium games were cancelled due to ongoing renovations at Ralph Wilson Stadium. However, Syracuse was hosting two games Friday night at the Carrier Dome, for a total of ten. Thursday, however, was a short drive to Parma for my first trip to Byers Field. For as many games as I’ve attended, I had yet to see the venerable, and yet rather plain, Byers Field. The Thursday night feature matched up Valley Forge against Revere. I sat on the Revere side to stay out of the sun. Why the home side faces the sun at any venue, is beyond me. This game was one-sided, but rather sloppy overall as Revere darted out to a lead, and then slowly tried to grind out the win, 28-14. The next morning was a long drive to Syracuse. Leaving from New Castle (PA) with my girlfriend, we drove the scenic route through Route 66 in Pennsylvania from near Clarion to Kane. I’ve stopped at this restaurant a few times now, and insist on stopping whenever I have the time. Texas Hot Lunch in Kane is a definite out of the way place worthy of attention. Really good food. From gyros, chili dogs, burgers, wings, etc. Then, it was up US 6 to US 219 to I-86 and up through the finger lakes toward Syracuse. Arriving just a half hour before the game, the parking situation at the Carrier Dome can be described as ‘limited’. Luckily, for Friday night, there wasn’t a lot of attendees at these games. Parking was more than the tickets, however, as $8 tickets were met with $10 parking. The first game was touted as the matchup of the weekend, as Christian Brothers Academy took on Henninger. It looked like CBA was going to win this one early, but Henninger made enough plays at the right times to take it, 20-13. The night game was Vestal over East Syracuse Minoa 47-13. 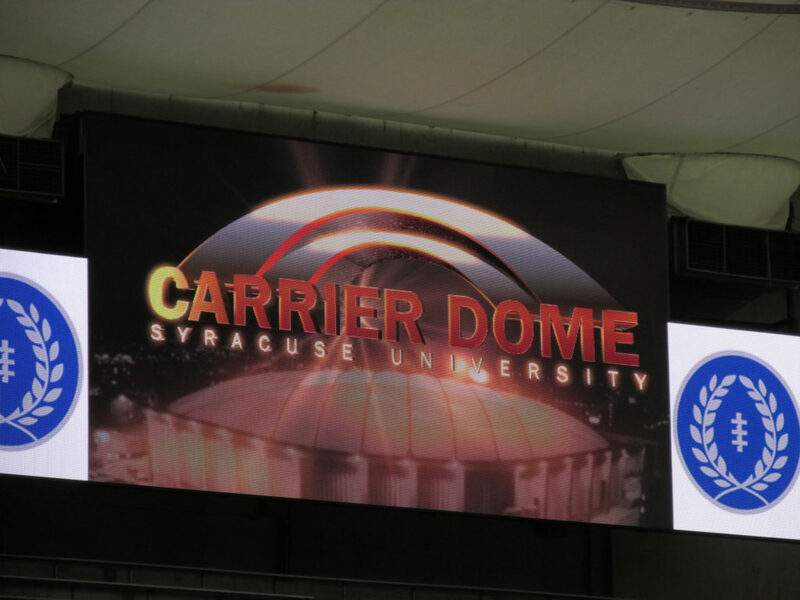 After staying at a rather nice Red Carpet Inn in North Syracuse for a very cheap rate compared to the surrounding hotels, it was back to the Carrier Dome for an 11am quadruple-header. Fonda-Fultonville lost the opener in slim margin to Westhill, 28-20. Next up, Watertown, from up north, lost 26-6 to Corning and only avoided the shutout late in the game. Finally, a team I was cheering for came through with the win in a big way, as Cornwall Central beat Amsterdam, 50-7. The finale was Cicero-North Syracuse trumping Fayetteville-Manlius, 42-28 in a surprisingly ho-hum affair. Now, at least with the Carrier Dome, you are allowed to leave and reenter. This made it nice between games as you could walk down into campus and get food, or go to your car. Food and beverage prices here were the usual NCAA Division I rates, which meant very expensive. However, the Varsity on campus had great food and we ate there twice. The wings, fish sandwich, and burger were all good between the two days. Now, for the Sunday games, I wasn’t feeling well, at all. So, the first three games were mostly a haze. We arrived at the first game shortly before halftime. I was going to cheer for Little Falls, however, they were already down big to Canastota. The final, was even worse, 53-0. The next game was Hoosick Falls-Owego, and I was once against cheering for ‘Falls’. This time, it was more enjoyable, as Hoosick Falls won 48-21 over Owego Free Academy. After the second game, we had walked down to Varsity for food and made the trek back up to the Carrier Dome. This third game was good, but rather lackluster in terms of big plays. Both teams did more ball control short yardage running, and it showed. After Thousand Island, the team I was cheering for, had a 7-0 lead, Jordan Elbridge scored a safety to make it 7-2. And late in the game, Jordan Elbridge scored their first offensive points, to take an 8-7 lead after wasting their two-point play. That ended up being the final, as Thousand Islands just couldn’t muster up enough offensive to move the ball quickly. Because of the constant running, the third game ended quite quickly and there was almost an hour wait until the final game of the weekend came around. In addition to the drive back, the delay, and another game, and how sick I was, I opted to head out and skip the fourth game. I had planned on working that Monday, but decided to just take another week off. It was a wise decision as I didn’t feel like moving for the next two days. By Thursday, though, I was up and about and had more games planned. Without one single non-regular Thursday game, it was off to Cupples Stadium on the south side of Pittsburgh for a Pittsburgh City League game. Allderdice was playing Westinghouse on Thursday and it was easily the closest game to attend. Westinghouse is the smallest school in the PCL, and are regularly the whipping boy of the rest of the league. I saw them play twice two years earlier, as they played Steubenville and Buckeye Local. Cupples Stadium, despite being a city stadium, is a very nice stadium. Artificial turf, and the large Mount Washington looming to the south as you look off from the home stands is a great seting. Also, the bridge over the railroad tracks on west end of the stadium gives it an industrial feel. The game tickets were cheap. $3 per person, and parking was entirely on the street. At one point, I counted 68 fans for Westinghouse on their side. Like most city schools, entry is restricted to one side or the other, there is no mingling of the fan bases. Allderdice’s crowd increased steadily through the first and second quarters. The game, however, was entirely Allderdice. Westinghouse got one fluke touchdown on a great play, but lost 48-8 with a running clock. As I cycle in to a more routine schedule for games, on Friday it was up to Greenville (PA) for their game against Warren. Greenville still clung to 2A despite shrinking enrollment, and Warren (PA) was usual selves. It was funny that it was back-to-back days seeing a “Dragons” team play. Unlike Allderdice, Warren had little offensive ability. Greenville nearly got the shutout, but lost it on a fumbled exchange returned for a touchdown. Greenville won, though, 35-6. On Saturday, I had two main options for early games. Either see another game at McKeesport (this time against Penn-Trafford) or attend a game in Glassport (PA) between South Allegheny and Quaker Valley. Given I had already attended McKeesport the previous year, and wasn’t that thrilled with their stadium, and not a big fan of their team in general, I chose for the smaller schools. I had seen Quaker Valley host Burgettstown a few years ago, and liked their team. The game was played at antiquated Glassport Stadium. It’s a beautiful, though aging, stadium sitting near the banks of the Monongahela River. It’s in a small river town, and the stands again only face southwest. With an overcast sky most of the day, it was a great venue. Much too large for the team today, but without visitor stands across the field, it held those in attendance quite well. It’s an old concrete structure, that reminded me of the stadium in Memphis (TX) I had seen a few years ago. Tickets were $5 each (relatively standard PA prices), but the game program was a ridiculous $10. I decided I didn’t need a game program that badly. As has happened in the past, though, Quaker Valley was just a better team. Calpreps had predicted a final score of 35-17, and weren’t far off. The Quakers won 35-7 and just would not relent on defense. It was then to Pittsburgh Steak Co. on the south side for a very good steak. A little pricy on Carson Street, but the steak was worth it. However, the baked potato had the consistency of dried mud. The calamari was exceptional, though. Now, I had lived in suburban Pittsburgh for a few years in my early 20s. Mt. Lebanon, to be precise. And though I was only a few blocks from this stadium, I had never gone to a game there. Mostly because my work schedule restricted me on Friday nights, and if I did go to a game, I’d attend a Mt. Lebanon game. However, Keystone Oak’s home field in Dormont is a very good venue with modernization. Also, it’s rented out on Saturday for Bishop Canevin Crusaders games, which is what I was headed for this time. Again, the parking is non-existent and you must find a spot on the street. Arriving about 30 minutes early, I still found a spot about a block away. Tickets were $5 each, and programs were a surprisingly cheap $2 for what most schools would charge $5. Dormont Stadium itself sits atop a hill overlooking Banksville Road. The stadium sits mostly east-west, with new aluminium bleachers on both sides with artificial turf. It is a very nice venue and one I wish I had seen previously. Especially for a Keystone Oaks game. Bishop Canevin is a smaller Catholic school in the Pittsburgh area and serves the southwest side of the city. Northgate is a small public school on the north side of Pittsburgh. Though they’re called the Flames, their uniforms are almost identitical to Nebraska, including the small block N on the helmets in red. The only difference is a near indistinguishable orange outline around the numbers. This game was cold, and the wind was strong. Calpreps had it pegged at a 21-20 victory for Northgate. The game was a bit of back and forth, but neither team really showing much athletically. Northgate had a 7-6 lead, and followed it with another touchdown late to make it 13-6 after a failed extra point because penalties pushed it back. Bishop Canevin, much to the officials credit, came back thanks to an inordinant number of flags for calls I didn’t see. They scored with about a minute left, and opted for the two-point conversion. A 13-12 win for Northgate would’ve been spot on for the 1-point margin by Calpreps, but it was not to be. Bishop Canevin converted the two-point conversion, and secured the 14-13 victory. Games in college venues can be fun when the venue doesn’t dwarf the crowds. The Carrier Dome is a great venue for high school football. However, it lacks air conditioning. Which is humorous, considering the name “Carrier” is after the Carrier Corp, which is named after the man who invented air conditioning. The seating, though, works. As did Western Kentucky, UT-Chattanooga, and Miami University’s stadiums. The best high school venue of the early season (and I won’t play favorites) would have to be Dormont Stadium. It sits on top of a hill, has great site lines, no track, new stands, crisp new artificial turf. If it weren’t for a few edges, I’d say Greenville, simply because I’ve always loved how close the stands are to a field without a track. The 28 games I attended had a aggregate final score of 1000-360, or an average score of 36-13. There was an impressive three shutouts so far this year, which is a bit of a surprise. Also, only two teams hit 50 points so far. Kentucky football is definitely a step down from Ohio on terms of relative school sizes. This is funny, considering Bellevue beat Finneytown (in a game neither deserved to win) and Beechwood made a valiant comeback attempt against Mt. Healthy. New York is an anomoly. The teams are much more fundamentally sound, but just lack the athleticism that other schools in PA, OH, or even KY showed. They’re good teams though. And their games were generally well coached, and the players executed well. It’s just there wasn’t those breakaway players you find in Ohio or Pennsylvania that tend to be a difference maker in a close game. I’m not sure if this is because football is less popular as an athletic contest, or what. I noticed this with the Orchard Park games last year in the playoffs. The Crosstown Showdown has definitely lost some of its luster. Hopefully the schedule can be better next year. Only one doubleheader and Saturday only had four games. The lack of Wednesday or Sunday games. It was just an excuse to charge more for what were generally regular season games at single site venues. Which is a problem. This week, I’m actually going to be in Massachusetts on Thursday. South Hadley (MA) hosts Amherst-Pelham Regional (MA) at 7pm on Thursday. I will be back in western Pennsylvania on Friday night for Greenville (PA) at Grove City (PA). And for Saturday, I have a two game trip through north Central Pennsylvania. First, is a stop in Sheffield (PA) for their game versus Elk County Catholic (PA), followed by a short trip into Olean (NY) for their rivalry game with Bradford (PA). Then, on Sunday it’s off to Cleveland for the Browns game against Baltimore. So, once again, a football filled weekend.